Welcome to the May 2018 Subscription Marketing update. 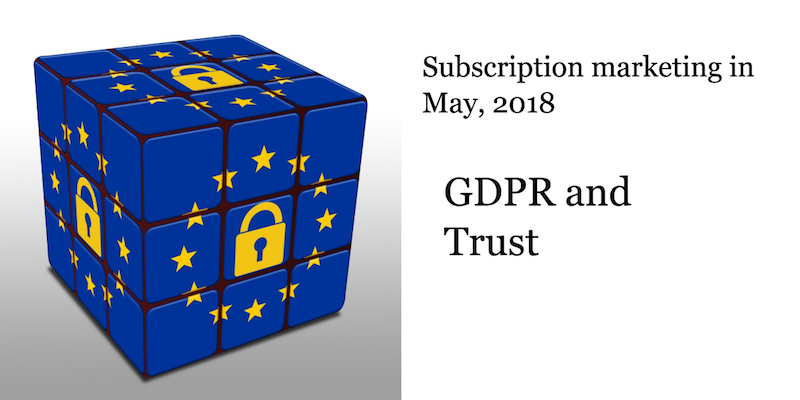 The main topic this month is, of course, GDPR. In many ways this policy is good news for subscription marketers, as it requires businesses to be more transparent about how they’re collecting information and what they’re doing with it. Doug Kessler of Velocity Partners makes a compelling argument that GDPR simply puts an end to “generally dickish practices” in marketing. Read it on the the Velocity Partners blog. Subscription marketing success, remember, is built on trust. By enforcing transparency and good practices, and taking aim at those who abuse customer information, this regulation is going to reinforce trust. The latest Amazon delivery vehicle is … your car? Amazon Key already had an option for opening your front door, now it can unlock your car trunk. These services aim to defeat the package thieves who grab deliveries left on doorsteps. Does anyone else find this slightly disturbing? I realize that a successful subscription is built on trust, but does this take “trust us” too far? Everyone will answer that question differently. If the potential for Amazon’s intrusion into your life disturbs you, I suggest you do not read this New York Times article about the Amazon Echo (and other home speakers) acting on stealthy voice commands that you cannot here. The CXL blog has a comprehensive post on different models for pricing subscription products. OpenView Ventures has updated its SaaS Pricing Resource Guide. Don’t forget the revolutionary FairPay model, by which subscriber negotiates a fair price with the provider. Learn more on Richard Reisman’s blog, the FairPay Zone. If you think pricing is tough, try raising prices! Current subscribers will never be happy with a price increase – they may feel like they’re losing something. You’ve got to counteract that. Amazon is upping the price of its Prime Membership (its main subscription offering) from $99 to $119. As a Prime member, I got the email about it and must say, the company is once again modeling effective subscription marketing practices. It notified me of the increase six months in advance. So, Amazon isn’t trying to sneak an increase past anyone. They now have six months to convince me of the higher value. Also, from a cognitive science aspect, the advance warning separates the “pain” of the price increase from the decision to renew. If you’d like to get this monthly update in your email, sign up below.